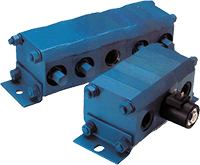 Rotary flow dividers are primarily utilized to synchronize the operation of multiple cylinders or fluid motors and to divide a pump's output proportionally among multiple circuits. They are also used to intensify pressure when pressure higher than the pump's capacity is needed in applications such as a clamping circuit. Rotary dividers are more tolerant of contamination, more efficient and less expensive than spool-type flow dividers. We have produced rotary flow dividers for many decades and have a worldwide reputation for providing the most efficient product on the market. What makes the Concentric rotary flow divider the best in the world is the precise design of bearing configurations, shafts and seals backed by a manufacturing process that ensures the optimum tolerances for performance and efficiency. Our applications specialists focus on collaborating with customers to meet their vehicle system goals. Partnership has been the key to our success in solving vehicle application challenges, whether the goal is better performance, reduced noise or vehicle emissions.